A recent Wall Street Journal article looked at the use of marijuana to mitigate the challenges of ultrarunning and enhance performance. The point was that THC is a banned performance-enhancing drug, so to use it during competition is cheating. Of course it is. Thank you, Rupert Murdoch. I have nothing against THC, especially for medicinal purposes. It is legal now in some jurisdictions, and there are much worse mood-altering substances, if that’s what you’re seeking to deal with “stuff” in your life. There are as many answers to the question: “why run 100 miles?” as there are ultrarunners. But there is a common thread that runs through us all—the desire to overcome huge challenges and achieve something epic, despite extreme fatigue, pain and discomfort. We are all drawn to facing and slaying inner dragons and demons: self-doubt, fear and the negative thoughts that would hold us back from being our true selves and living our intended lives. Experiencing the dark places and then pushing through them in an ultra is life affirming like nothing else. The only more visceral place than the finish line of a 100-mile race is the starting line—and that’s because you are about to dive headlong into the intensely real experiences in between. A 100-mile race takes you to places you otherwise would never go, physically and mentally. Who needs drugs when you can run 100 miles? It’s April, so if you haven’t signed up for that big scary ultra that is beyond your ability, now is the time to do so. Sure, many of the classic ultras have lotteries and limited space, but there are so many new and exciting events to choose from. Check out our race calendar on page 70, or our online calendar at Ultrarunning.com and have at it. Your destiny is there waiting for you. In this issue, we have plenty of great articles to help and inspire you. Even though much of the country has endured another frigid winter, the opposite climate extremes lurk and we’ve got the goods on heat training and racing, as well as performing at altitude. 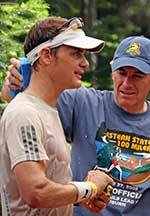 There’s also great stuff on aid stations, crew and pacer selection as well as walking strategies. Ultrarunning is a form of travel, and in this issue Ian Sharman explores the adventure inherent in ultrarunning, and we introduce our UltraTraveler feature. Be sure to check it all out and then make your ultra travel plans.